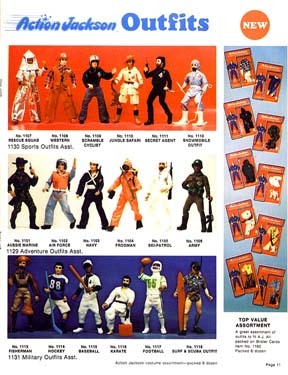 AJ's outfit assortment came with 18 distinct costumes, and are found in all manner of factory variations. These variations, and the specifics of each set, will be detailed in the Museum in the near future. Most outfits were sold in flat window boxes, and with a variety of packaging graphics. The carded example featured here in the catalog ended up being the most rare of them all. The black scuba jumpsuit being particularly impressive compared to the orange.